Maintain a healthy, dust-free environment and protect the quality of your work with the Nilfisk CFM 125 industrial vacuum cleaner. A powerful cleaning machine that’s ideal for industrial and commercial businesses. 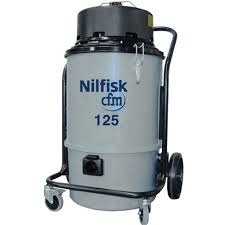 Featuring a lightweight, durable plastic design, the Nilfisk CFM 125 is ideal for use with surface preparation tools and equipment in the concrete, woodworking, and general construction industries. A wide range of hose and accessories are available to meet all of your cleaning needs. Main filter area 16.15 sq.ft. HEPA filter area 32.3 sq. ft.